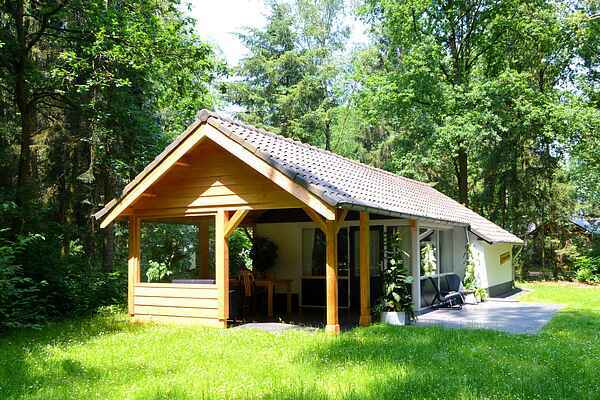 Wonderful detached holiday bungalow in a quiet area of a natural holiday park. The house has a very modern and properly equipped kitchen, a large and luxurious bathroom and large windows so it is wonderfully light and you have a view of the attractive surrounding nature. Nature lovers will definitely feel at home here. The park with restricted traffic is also characterised by the beautiful mere and you can find small playgrounds where the children can enjoy themselves. Stramproy is a small northern Limburg village with several restaurants with cosy terraces, cafés and a well provided for choice of shops. The immediate vicinity offers natural areas such as Tungelerwallen and the Stramproyse heath. There is an extensive network of cycling routes for hikers and cyclists. Several golf courses of various levels can be found nearby. A little further on you can find the town of Weert where you can enjoy an afternoon shopping or sit on a terrace. A small hours drive takes you to larger cities such as Roermond, where you can shop till you drop in the outlet centre and always cosy city of Maastricht.